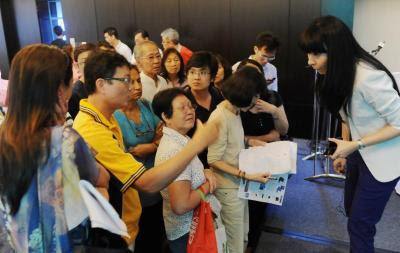 The Star Property Fair 2012 ended with a bang with six major exhibitors from Penang and Kuala Lumpur generating some RM100mil in sales. About 35,000 visitors turned up for the four-day fair, which ended yesterday. Most of the properties sold were high-rise units on the island priced from RM500,000. Houses in Seberang Prai were mainly bought by first-time Penangite buyers and those who wanted to move to higher-end properties. IJM Land general manager (North) Toh Chin Leong said the group sold RM34.5mil worth of properties, generated by Vertiq, The Address and The Light Collection One and Two. Tambun Indah Land Bhd executive director Teh Theng Theng said the group sold RM22.4mil worth of properties, comprising semi-detached and terrace houses in Seberang Prai and condominiums on the island. “The landed properties are from the Pearl City@Simpang Ampat and Carissa Villas in Butterworth, while the condominiums are from the Straits Garden project in Jalan Jelutong, which is five minutes from the Penang Bridge and the city centre,” she said. SP Setia Bhd (Penang) sales and marketing manager Susie Loh said the group registered RM13.3mil in sales from the Setia Triangle in Sungai Ara and Setia V Residences project in Gurney Drive, which were priced from RM575,000 to RM2.73mil respectively. Ivory Properties Group Bhd corporate communications manager Ann Tan said the group sold RM10mil worth of projects, comprising sales from The Latitude in Tanjung Tokong and The Wave in Penang Times Square, which are priced between RM600,000 and RM700,000. Ideal Property Development Sdn Bhd sales marketing manager Teh Yeow Jin said the group generated some RM10mil in sales from its Fiera Vista condominium project in Sungai Ara, with units priced from RM500,000, and commercial lots priced from RM300,000 at The One mixed condominium project in Bayan Baru. Mah Sing Group Bhd (Penang) deputy general manager Serena Cheah said the group generated RM10mil in sales from its projects in Penang and Kuala Lumpur. “We received 1,280 registrations for our projects in Kuala Lumpur and Penang. Of the names, about 80% signed for Ferringhi Residence project units that are priced from RM900,000,” Cheah said. Units at M City are priced between RM600,000 and RM1.3mil while those at Garden Plaza are between RM300,000 and RM600,000. Meanwhile, the Platinum III, the affordable housing project from TPPT Sdn Bhd, a wholly-owned subsidiary of Bank Negara Malaysia, received over 600 registrations. Located at Teluk Kumbar, the houses are priced from RM400,000. The Star editors and management are such a hypocrite !!! Condemning Lim Guan Eng's government for continuing to allow BN's approved high rise project just a few days before their own organized biggest property fair in Penang ! Real stupid paper and management. Damn hypocrite!!! Nice and information blogs about property renting thanks for sharing information. I considered this fair a failure. If you notice there was like more than 5 developers from KL promoting KL property. 1st time in 4 years I am seeing this in Penang Property Fair. No buyer in KL new launch property? Well said frogprince. I share your sentiments. Can't stand the Star's hypocrisy. Nowadays I read the Star to keep myself updated on all the poppycock they write. I have been reading this paper for many years but No more, switching over to the Sun at least better not so politically one sided. Why do the developers offer a lot of perls/benefits to buyer nowadays? 10-3-1 (Translated to ten people booked, 3 person arranged for financing and one person bought). So, out of 100 million sales reported, only about 1 million or two units sold. That's the other part of the story not reported. Try to check from time to time. You'll notice it's fully booked, not fully sold. Most developer just hide some units and release it when the price is higher. Unbelieveably smart. With the Bank Negara tighter lending guidelines, the big boom might turn up to be big doom.